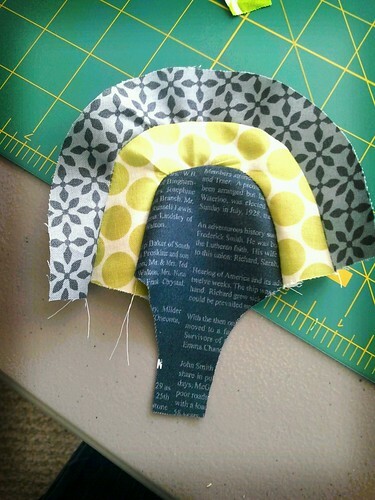 Yesterday I worked on my Pillow Talk Swap. There are so many amazing pillows in the group already, and so many things I wouldn't have thought of that I love, in colors and patterns that I don't normally gravitate towards. Maybe next swap I'll just have to tell my partner to do whatever they wish! Eep, so scary. 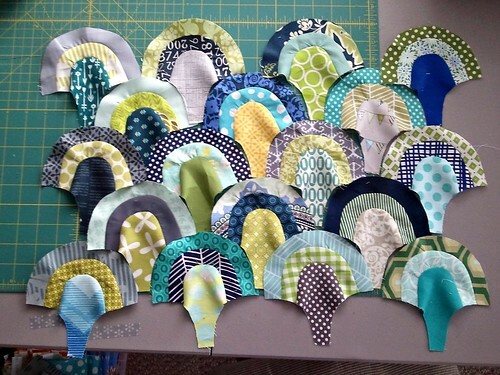 As for my project, I sewed all 18 clamshells together. How does one figure out how many of a curved shape will make a finished 20" square pillow? Because I have no clue, so I just made clamshells until I ran out of fabric. 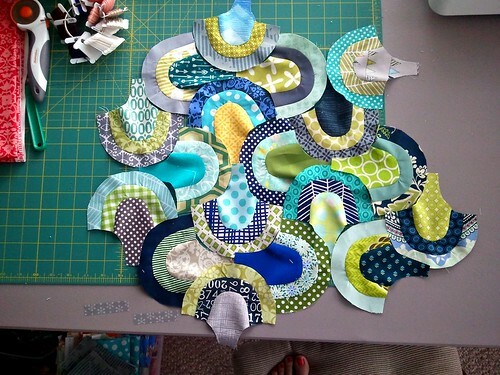 18 clamshells, with 3 fabrics in each = 54 different fabrics so far in this pillow! Needless to say, it makes it sound like I have a huge stash, but this was an excellent opportunity to use scraps! In fact, with the exception of 3 pieces cut from charm squares and 3 pieces cut from yardage [I was running out of different fabrics, since none are repeated], all of these were from scraps. So 48 pieces out of 54 from scraps is pretty darn good. In fact, I didn't even realize it, but now that I do, I'm going to have to show these little guys off over at Rachel's Scrap Attack party! Isn't it crazy that they start out like this going into the sewing machine? Oh, curves. And for all of you who are horrified at this many curves, I didn't pin, and it only took me about an hour and a half to sew them all together, with some interruptions. Then yesterday afternoon I posted two layout options. My original sketch was for the bottom bit o' craziness, but I have to say that I like the top choice too. It gives it a completely different look. I think the more organized layout might be neat if there was a little more consistency in the fabric or placement choices, like if all the centers were the same color or something. So which layout do you like better?! And would you be interested in a photo step-by-step of how this is done + my templates? ETA: I also just read about the Scrap Attach Flickr group, so these are now over there, and at the Stitched in Color Linky party. Oh, the Internet! I like the first one better. I can't wait to see it finished. i love them both! the first has a more expected feel to it, the second a bit more quirky and out of the ordinary. neat curves, for sure. 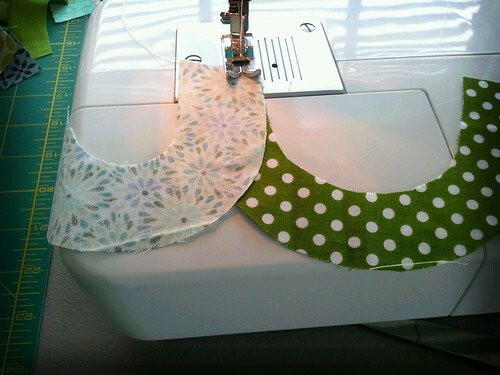 Both are great and I have to say you are BRAVE in my book to do so much curved seam piecing! I would never attempt this pattern - i sew and quilt in straight lines! I really like the crazy one, but, that's the way I love to quilt. I'm one of the weird one's that love to sew curves. I would enjoy your patterns and a step by step info. My question is, how are you going to sew it together? Can't wait to see the finished pillow. oh my...this are so beautiful! lovely piecing! So, WOW! I find the 2nd one really interesting and eye catching, but I'd probably favor the 1st one for my house. How neat!! Now that is a lot of work! Those are so cool! I'm more drawn to the orderly row version, but that's just me. Oh, wow, that's so cool! I think I lean towards the first one, but that is just so neat! Oh, and I would *love* to see the templates and a how-to. Silly weather, Trix are for kids! Today is a race against the clock!